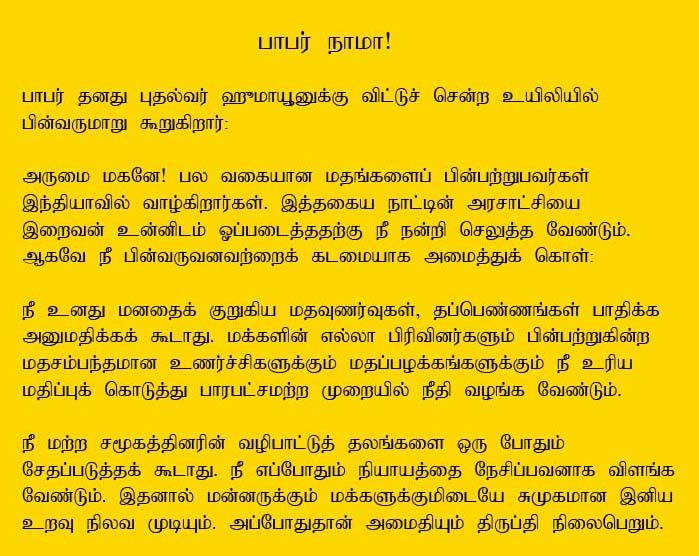 The editorial in 'Dinamani' talks about the proposed solution for the Ayodhya dispute offered by Shri Shankaracharya of Kanchi in Tamil Nadu. The details of the proposal have not been formally disclosed, but its main points have emerged. Firstly, it says, a new temple must come up in the place where once Babri Masjid stood. Secondly, a mosque would be built in an adjacent land. Thirdly, the Sangh Parivar activists would give up their demand for destruction of mosques in Kashi, Mathura and other Islamic sites. Fourthly, Archaeological Survey of India would permit conduct of daily prayers in hundreds of muslim monuments where currently no prayers are allowed. Representatives of several muslim bodies have broadly welcomed the proposal, but the Vishwa Hindu Parishad (VHP) has strongly rejected it. My Note: The above looks like a good approach to finding a solution to this never-ending conflict. When this agreement is finally put into practice, it will result in peace and harmony between both communities, and enhance them socially, politically and spiritually. Ayodhya dispute is a very strong emotive issue for a lot of us. Many possible solutions have been offered over the years. They broadly fall under these categories: maintaining status-quo, the Mosque is rebuilt or a new Temple is built, a public utility like hospital, park, school, college etc comes up in the place, accept court verdict or settle through negotiation. I am an Indian, a Muslim who is concerned about the cost this vexed issue has inflicted on our country and on our people. The views I give here are purely personal and no way suggest to speak for the community or any organisation. But I am confident - these views are not too far off from what majority of peace loving Indians would agree with. Any solution to Ayodhya is not just a solution for Muslims and Hindus but for Indian secularism — so that India can say to itself and the world that it was fair and just to all. India is a country of bewildering diversity. No single community can claim the entire credit for the richness of its culture, heritage and traditions. It has inherited its composite culture from the east to west and north to south. What's praiseworthy is the fact that despite this diversity, India has maintained its unity and its leaders, particularly those who led the freedom struggle, always felt proud of the 'Unity in Diversity'. Ayodhya, the place where the Babri Masjid was built by the Mughal emperor Babar in 1528 AD, became a Site for conflict only in the 19th century. The Britishers had consolidated their hold and dominations in Bengal and Bihar before the advent of the l9th century and Awadh was their next target. The Britishers were facing strong resistance from the Hindus and the Muslims in their campaign to occupy Awadh. In pursuance of their policy of 'Divide and Rule,' the British invented stories and fabricated history to sow seeds of hatred and enmity between the Hindus and Muslims. The Britishers systematically planted false stories against the Muslim and particularly against the Mughal rulers as they were trying to usurp the rule from them. Their aim was to gain sympathies of the Hindus for their campaign against the Mughals and to weaken the resistance of Hindus and Muslims opposing the British occupationist moves. They succeeded in creating a divide between the two communities at Ayodhya which resulted in the Hindu clash over Babri Masjid in 1855. It was the first ever encounter between them for this place of worship. The issue of whether Ayodhya was the birthplace of Shri Ram, and whether the Mosque was built over the Temple, has left many historians preoccupied. A section of Hindus were forced to believe - for political reasons - that Babar had built the Mosque on the birthplace of Shri Ram by destroying a Temple. The Sangh Parivar (RSS family) activists, who have conducted the campaign for the Temple for nearly 20 years - will not be readily amenable to the Mosque being rebuilt at the Site. As for the Muslims, Islam doesn't allow building of Mosques over the ruins of another place of worship. It is un-Islamic for Muslims to pray for even a single day at such a place. However, to give up a place where the Mosque stood for nearly five centuries - without them being convinced a Temple existed there prior to the Mosque's construction, would raise the levels of anxiety among Muslims to new level. They would argue that giving up the land would open Pandora's box, with new extremist organisations coming up in nook and corner of the country - laying claim to other religious places. Of the many options, in my view, the option of status quo will not be accepted by both the groups - those who want the Temple there and those who want the Mosque to be rebuilt - for various reasons. This is very much like closing our eyes and wishing that the problem would go away. There would always be people who want to keep going back to the issue. Rebuilding the Mosque or the Temple at the Site without either a court verdict or negotiated settlement is possible only through an executive order (Parliament enacting a law) or when either side gives up its claim voluntarily. Having become an emotive issue - fuelled by vested interests - it is difficult for me to imagine this problem being solved this way. On the contrary, I believe, this would further divide communities. For example, on questions like who represents Hindus, who represents Muslims. The third option - namely building a public utility like hospital or educational institution - is a very noble and all-inclusive solution. I also believe a lot of people would accept this plan - given that a lot of blood has been spilt on the issue. This also avoids another danger - a sense of victory and loss in both communities - if only a Mosque or a Temple would come up at the Site eventually. However, I do not see this seeing the light of the day - unless the media and the politicians show up courage and build public opinion to this idea. The last option is either Court Verdict or a negotiated settlement. At the end of the day, this is a legal dispute - as to who owns the title of the land. The Supreme Court of India today is a very respected body in the country, seen to be neutral and fair by all the communities. Various Muslim bodies have broadly conceded that they would abide by whatever decision Supreme Court takes on the issue (even if it goes against the Muslims). This is also the view of many secular Indians. However, there are couple of untenable arguments put forward against going for Court Verdict. First is that it is an emotive issue and Court cannot decide on this. Second is that Muslims did not accept the verdict of the Court in the Shah Bano case. Looking into the first argument, it is precisely the reason why there should be the court verdict to decide on this issue. Being an emotive issue, a judgment that is seen to be fair and handed out by a body that is neutral would be and should be acceptable to all the communities for the sake of primacy of rule of law. By not conceding to accept the verdict of the Court, the activists of Sangh Parivar - who say the Court is not competent to judge on this issue - forget that this stand of theirs leaves room for suspicion that the evidence on which they claim a Temple existed at the Site prior to the Mosque's construction is not strong. With regard to Shah Bano Case, people forget several facts relating to this event. One must remember, the verdict in the Shah Bano Case did not take away from any other community any of their rights or land nor cause injury to them. The Court Verdict - which asked a Muslim ex-husband to pay for the maintenance of his Muslim ex-wife long after the marriage had ended - was going against the Muslim Personal Law. Indian Constitution had clearly prescribed that - in the areas of Marriage, Divorce and Inheritance (and these areas alone) - each community - be it Hindu, Muslim or Christian - shall be governed by its own laws. The Supreme Court verdict was against the letter and spirit of the Personal Law of the Muslims and this necessitated the enactment of the Act by the parliament. For the sake of Justice and for the sake of future generations, the court verdict would always be the best solution. However, given that even this - at the end of the day - would leave what would be seen as a winner and a loser, many have proposed a negotiated settlement - which would involve give and take from both the sides. The main problem with the negotiated settlement is to find out who is the true representative of the Hindu community or the Muslim community. Muslims haven't voted for any Muslim party to speak for them. Being a respected body, their seems to be an emerging consensus that All India Muslim Personal Law Board could speak on the community's behalf. As regards to the Hindu Community, who speaks for them? Is is the BJP who got just about 20% of the vote in a country where 82% of the population is Hindu? Is it the Shankaracharyas? Is it the VHP - whose popularity has never been tested? It is still not clear. Given all this dilemma, at the end of the day, it may still come to talks between Muslim groups led by All India Muslim Personal Law Board (AIMPLB), All India Babri Masjid Action Committee (AIBMAC) and the Hindu groups led by Shankaracharyas and representatives of the Sangh Parivar (RSS family). We all agree that communal harmony is needed. The Wakf Board has given up so much land in so many places, for schools, colleges, etc in the past. It is nothing new; all for the sake of communal harmony. The Ayodhya issue has led to a lot of violence and would lead to more violence in which more poor people will get killed. Human life is most valuable and no more blood must be shed on this issue. We must develop a spirit of give-and-take. Muslims, even though they have had a strong title claim to that Site, should show magnanimity as Holy Quran and our noble prophet Muhammed (Pbuh) have taught us. As a one time gesture, they can give up their claim to the Ayodhya site and Shri Ram Temple could come up in the place. With this issue behind us, the fanatics would lose an issue to divide the Hindu and Muslim communities. Mosque comes up in a nearby place. Sangh Parivar (RSS family) activists promise not to raise any further disputes about any other places of worship (including Mathura and Kashi etc). The whole settlement should be made binding on all parties - now and in the future by being made into an Act of Parliament unanimously in consultation with the Supreme Court of India. This would allow strict enforcement of these provisions and would deter any troublemakers from causing further trouble on this issue in the future. Thousands of innocent civilians of both the communities have died over this issue in the years that have gone past. In places like Mumbai, Ahmedabad, Banaras, Jaipur, Godhra and Gujarat - communal riots had torn, once peaceful, communities apart. For a country that is aspiring to become a developed nation by the year 2020, it is about time we put our troubled past in the past and march ahead into the future - confidently and without any hatred. Let us move ahead and take this country to greater heights it deserves. This will set a new trend where communities will sacrifice their interests to have communal harmony. Just imagine the world without communal fights. My message is that - The Almighty has never asked any one to fight always. Rather He has asked us not to fight but love every one, because love gives happiness and strength and kindles growth of brotherhood and peace in the world. We cannot leave it for the succeeding generation of Indians to fight it out violently. Such disputes will only weaken our sense of national integration. We should not fight with each other, but solve problems with reasonable facts and realities. Dear friends, don't hurt religious sentiments of other communities, unity in diversity, humanity and compassion are the noble virtues needed among men today to promote communal harmony. My wish and prayer "Our Lord! Help all communities live together in peace and harmony. Our Lord! Make my nation peace and prosperous. Jai Hind (Victory To India). In Death they were all the same, Christians, Hindus, Muslims and Buddhists. When Tsunami struck, it made no discriminations. When Death doesn't demarcate, Why do we Fight in the name of Religion while we are alive? I am personally of the view that, Muslims should now totally abandon the legal fight for the Babri Masjid, which not only involves expenditure so huge, but time and energy of the Community. Instead, they should now leave the matter entirely in the hands of the Government of India, the Members of Parliament of India and the Political Parties of the country to take the issue to its logical conclusions, under the Constitution of the land. I, for one, strongly feel that, it is time for Muslims to concentrate their entire attention, energies, money for education and economic development of the Community by which, they can now grab the opportunities for progressing now and in our future generations. I also believe that, even if the Supreme Court ultimately gives a judgement in our favour, a large section of the Hindu Community, will never allow the Masjid ever to be built, by the Muslims or the Government on the same site. Now, the Muslims should talk to the Government of India at the highest level to provide education to Muslims on a massive scale along with their Economic Development and Employment, all as a compromise by giving up their claim for Babri Masjid. I am sure future generations of Muslims will appreciate this. Mughal Emperor Babur advice to his son: According to a document available in the State Library of Bhopal, Mughal Emperor Babur left the following will to his son Prince Humayun. My son, take note of the following: do not harbour religious prejudice in your heart. You should dispense justice while taking note of the people’s religious sensitivities, and rites. Avoid slaughtering cows in order that you could gain a place in the heart of natives. This will take you nearer to the people.